Flowering habit at Ulana St Makawao, Maui, Hawaii (USA). April 11, 2010. Altitude: 900-2700 meters above sea level. Description: Tillandsia crocata is a xerophyte, epiphytic or saxicolous (rock-dwelling) bromeliad with silvery grey-green leaves. It may be simple or or spreading through few branched horizontal rhizomes and forms miniature bundled clumps about 10-20 cm tall and wide. Its delightful yellow flowers waft one of the strongest and most delightful fragrance of any Tillandsia and warrant its great desirability among collectors. Rosettes: Untidy with distichous (in opposing rows), spreading, and slightly recurved or reflexed leaves. Leaves: Up to 15 cm long, tough, linear, attenuate, involute, stems like, semi-cylindical and channeled on the top surface, greenish to grey-green, with entire margins, coated by dense silvery coarse scale-like trichomes, the wings of which are large and elongated on one side. By rising up from the leaf surface, the wings aid in the epidermal drying process by facilitating greater air movement. This faculty is essential for clumping species that receive water frequently at certain times of the year. Inflorescence: It produces a fine extended scape that subtends the simple, distichous inflorescence with 2-4 flowers. The densely lepidote floral bracts are imbricate. Flowers: Funnel-shaped, bright canary-yellow or buttercup-yellow, that have 3 petals with one of the sweetest fragrances in all the bromeliad world.among gray-scaled floral bracts. 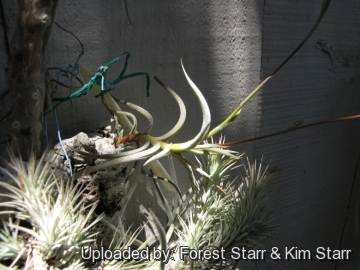 1) Forest & Kim Starr “Tillandsia crocata (Hair plant)”. Plants of Hawaii. <http://www.starrenvironmental.com>. Downloaded on 20 August 2014. 3) Wikipedia contributors. "Tillandsia crocata." Wikipedia, The Free Encyclopedia. Wikipedia, The Free Encyclopedia, 6 Jul. 2014. Web. 18 Sep. 2014. 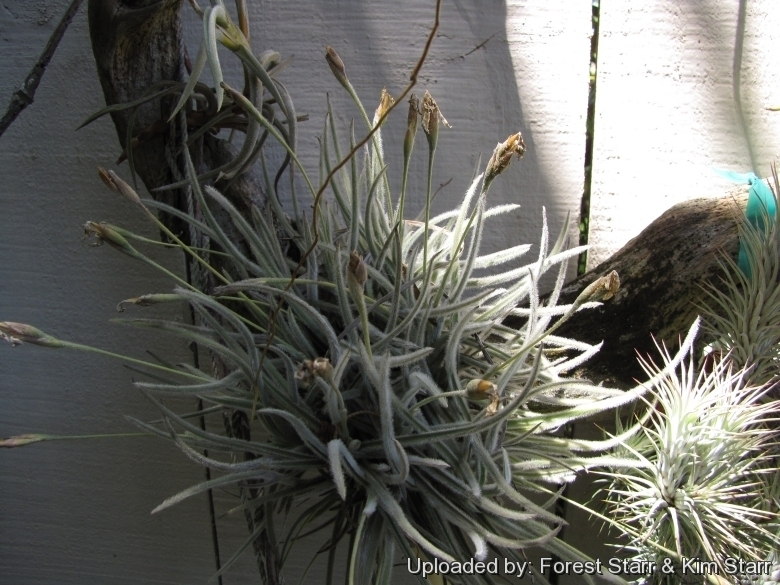 Cultivation and Propagation: Tillandsia crocata is easy to grow, drought tolerant, and will thrive within a broad latitude of care conditions. Locate in a well ventilated place. Tillandsia crocata is perhaps the best of the fragrant tillandsias for cultivation due to its tiny size. Soil: This species prefers to be grown without soil mounted on wood or grown bare root on slabs of bark or tree fern fibre or on nearly any substrate. A and, if potted, it must be in a free-draining soil (i.e. leaf mold, peat and sphagnum added with perlite, sharp sand or orchid bark). pH Range 5,5 to 7,5. Exposure: This plant likes bright indirect light and protection from hot sun, it is best placed in a sheltered spot in the garden during the summer to facilitate flowering. In a dark location the plant will gradually weaken and wither. Waterings: Allow medium to dry out between watering. From mid spring through fall, mist daily. If grown outdoors, keep dry during winter. Tillandsia crocata is quite drought tolerant, however because of its small size cannot survive lack of water or humidity for as long as more succulent and larger-leaved species such as Tillandsia duratii. All of the leaf surfaces should dry between waterings. If the plants in a clump become wet and remain so for a few days they may suffocate and die. In a clump, air cannot circulate among the leaves as well as in individual plants.